The new Top Golf on Wednesday, Nov. 7, 2018, in Pharr. PHARR — The newest addition to the upper Rio Grande Valley skyline is scheduled to open in mid-November, and Topgolf, the sports entertainment venue, has not been shy about its debut. The venue, which Pharr paid roughly $5 million of taxpayer money to set roots in the city, hosted local leaders, the business community and the media to tour the three-story space on Wednesday evening, handing out free adult beverages, hors d’oeuvres and prime rib. Topgolf is a driving range on steroids, with the one in Pharr having two full-service kitchens, patios, a beer garden, three levels of hitting bays and a 27-foot television screen that can broadcast one channel or be split into eight. The nets surrounding the driving raging rival the height of the Bentsen and Chase towers. No smoking of any kind will be allowed, as the venue hopes to promote a family friendly atmosphere. If needed, patrons can go outside the venue to smoke. Topgolf will open at 9 a.m. every day of the week and close at midnight, aside from Fridays and Saturdays, when it will close at 2 a.m.
Cliff Twiggs, director of operations at the Pharr site, said there are more than 360 people on staff. 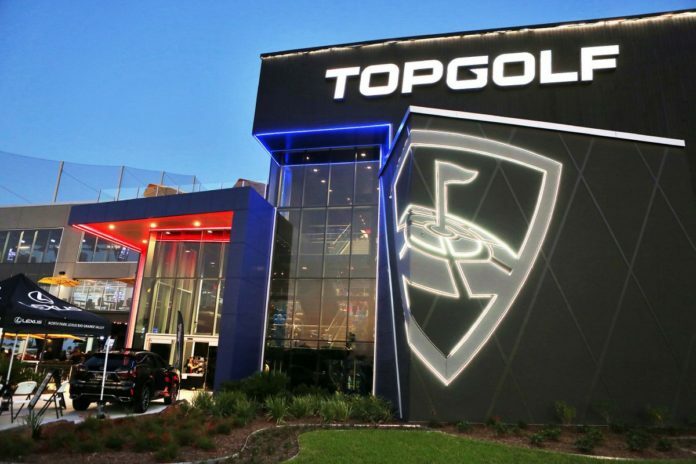 In order to lure Topgolf to Pharr over neighboring competitors, such as McAllen, Mission and Edinburg, the city gave $1.2 million in cash incentives. Pharr also issued a 50-percent reimbursement of sales tax for 15 years and a 50-percent reimbursement of property tax for 10 years, former City Manager Juan Guerra said earlier this year. Officials in neighboring entities raised their eyebrows about Pharr’s incentive package, skeptical that it would bring in the kind of revenue to justify the incentives. But Pharr Mayor Ambrosio Hernandez, in an op-ed earlier this year, defended the city’s agreement. “Again, the total incentive package is expected to have a zero net impact on the Pharr taxpayer, while reaping the benefits of new jobs, a boost in economic activity for our area,” Hernandez wrote. Guerra, who led city staff in negotiating the deal, left Pharr last month. He is now the city manager in Edinburg.